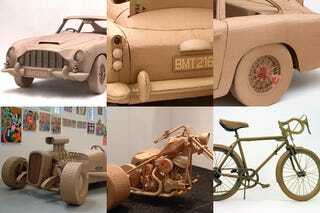 Gilmour has imposed a strict logic on his works he makes objects using only cardboard and glue. There is no supporting structure, no wooden or metal frame. His interpretations of everyday objects are created in adherence to the use of a pure and single material, but instead of the marble or bronze of classical statues, he has chosen one of the most humble and commonly found of our industrial times. It's true: the detail and fidelity are amazing. Too bad cardboard is not rain proof, like marbel and bronze. On the positive side, knowing that Bond is a noted Dry Martini addict who crashes every single vehicle he gets his hands on, giving him a cardboard car to fight against a cardboard SPECTRE is not a bad thing at all.